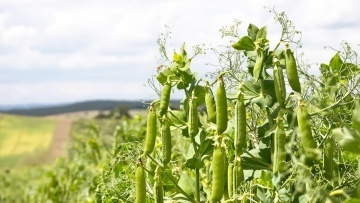 Nirvana® is a herbicide containing pendimethalin and imazamox, for the pre-emergence control of a range of broad-leaf weeds in winter and spring field beans, combining peas and vining peas. A herbicide for the pre-emergence control of a range of broad leaf weeds. It can be used on winter beans, spring beans, combining and vining peas, so only one product is needed for herbicide control in legumes. Its active ingredients are pendimethalin and imazamox. The pendimethalin gives long lasting residual activity. Co-formulation of pendimethalin with imazamox provides enhanced control of a broad range of weeds. Nirvana® is a herbicide containing pendimethalin and imazamox for the pre-emergence control of a range of broad-leaf weeds. It is an effective pre-emergence herbicide in a crop group with very few post-emergence herbicide options. The pendimethalin gives long lasting residual activity to ensure crops get away with no competition. Nirvana® offers broad spectrum activity for early control of a wide range of competitive broad-leaf weeds. It can be used on winter beans, spring beans, combining and vining peas, so only one product is needed for herbicide control in legumes. Other specific restrictions To avoid the build-up of resistance, DO NOT apply this or any other product containing ALS inhibitor herbicide with claims for control of grass-weeds more than once to any crop. 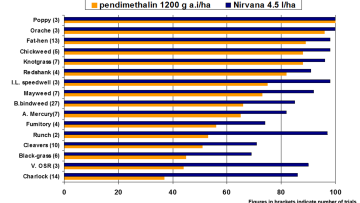 In European trials, Nirvana® is shown to improve weed control when compared next to straight pendimethalin.